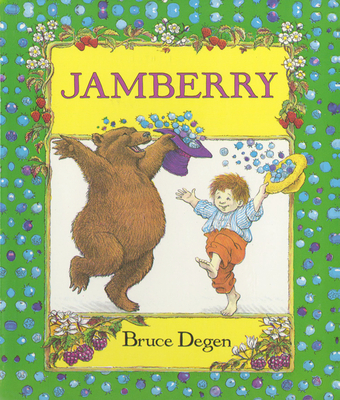 This bestselling classic features a berry-loving boy and an endearing rhyme-spouting bear. The fun wordplay and bright paintings with lots of details for young readers to explore make Jamberry a perennial favorite, and this board book edition is a great stocking stuffer. A small boy and a big friendly bear embark on a berry-picking extravaganza, looking for blueberries, blackberries, and strawberries. Their fun adventure comes to a razzamatazz finale under a starberry sky. From author-illustrator Bruce Degen, Jamberry is perfect for sharing. "With delightful, rich illustrations and zany wordplay, Jamberry is a must have book for any family with young children," according to Children's Books Guide. Looking for berries...Berries for jam! Bruce Degen is the bestselling author and illustrator of the beloved, perennial favorite Jamberry and numerous award-winning books for children. He is the author and illustrator of Daddy Is a Doodlebug and Sailaway Home as well as the illustrator of the highly acclaimed Magic School Bus series by Joanna Cole; the ever-popular Jesse Bear books by Nancy White Carlstrom; Jazzmatazz! by Stephanie Calmenson; and Shirley's Wonderful Baby by Valiska Gregory (available at your local library). Bruce Degen's involvement with art has ranged from painting and printmaking to teaching art in New York City schools and directing an artists' lithography studio in Israel. Mr. Degen studied art at the Cooper Union and Pratt Institute. He was born in Brooklyn, New York—just like Charlie Muttnik—and now lives with his family in Connecticut.